There are times when i close my eyes and listen to whats going on around me, trying to find the music in the noise and the peace in the ruckus. Its just a way of clearing my mind and appreciating the good things in life in the midst of bad moments. An eleven year old boy did that too, and he changed the lives of many, including his. 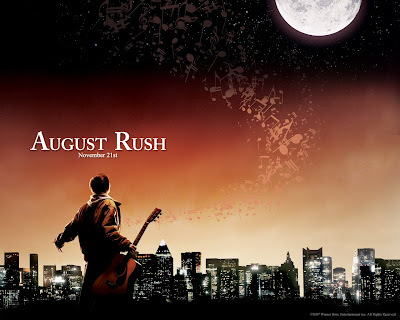 His name was August Rush. He listened to the music in his surroundings, and he put his family back together. i was totally lost for words when i watched this movie because it told the world what music really is; all around you. What saddens me is that only some people see that. only some people can hear. and out of the some people, only a few appreciate it. When August told everyone that he was planning to find his parents by listening to them through music, everyone definitely thought he was nuts. This part unfortunately, isn't fiction. I read the reviews on this movie and sadly, the movie only scored 38 out of 100. Its not for everyone. To those who hear the music, people think they are nuts. but the truth is, those who can hear, find their destiny like how August found his family. "what's the thing u want most in this world? ", asked wizard. August closed his eyes and thought for a moment. "To be found", he replied. I have to mention, u don't have to be a musician to hear the music, u don't have to have special ears,but u need a heart that is open. Music is in the things that u love. Be it Cooking, Football, Chemistry, Painting, Writing, and the list goes on. Isn't it a wonder why so many people compare their love for something, to music? i do that too. when Eboue Crosses the ball to Fabregas, who heads the ball into the top corner, its music to me. When Jamie Oliver drizzles his meat with Lemon juice, its music to me. When Tony Hawk approaches the lip of the vert ramp and goes aerial spinning a 900, and landing safely on his skateboard, its music to me. 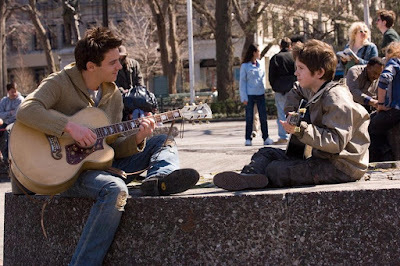 August Rush is an inspiration. 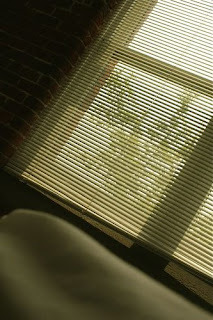 for a point in time, i was not quite sure if people could hear and see things like how i see and hear them. now i know, there are people who see like me, who hear the music all around us. who open up their hearts to listen. If u love something enough for it to be compared to music, this movie will be your lamp of hope for years to come as will it be mine. 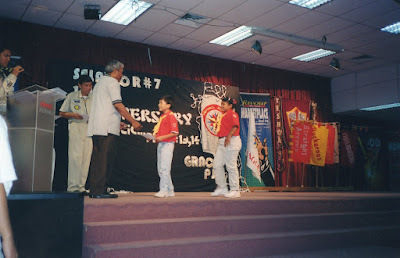 Over the weekend, Selangor#7 went to Bukit Cahaya to celebrate 20 years of existence! we had an overnight camp with an awesome council fire that had an amazing more or less 150 person turn up.now thats a big council fire. and its also our first,using electricity. haha yeap, slideshows,projectors, Speakers,Mics, Spotlights, u name it. According to ps henry, one of our Menteri said Royal Rangers is the longest lasting, most succesful youth program in our nation. i couldn't agree more. I've been in rangers for about 9 years now, and i've grown a lot in this ministry. I would say that it's made me who i am today. 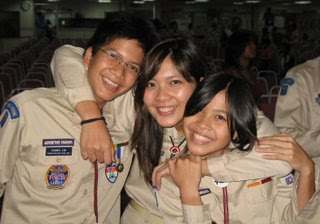 My sisters and I, after 9 years. Sarah and Zoe recently left rangers this year. Sarah has been in rangers for 11 years and Zoe, 9 years. The truth after a lie. a 77 year old man once said : "there is no greater wealth, than health"
I realize i'm prone to all sorts of sicknesses and injuries. On any normal day i'd fight it out. but this one is a really bummer. i mean,c'mon, i freaking need to breathe and talk la. All i can do now is hang on to hope of a recovery that is almost guranteed to be given by Him. and for that, Thank You Lord! that's still bleeding in the pain. So i'm still barely holding on to You. There are times where i still find myself stuck, barely breathing. but i will never regret my decision to hold on to the closest comfort that anyone could ever have. He is who i find peace and rest in. 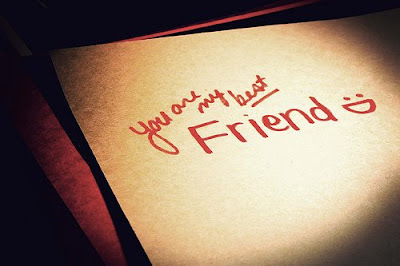 He is my best friend. He died for me, and there's no greater love than for one to lay down his life for another. Above all, He's my God and i know that He's my healer. I could sing of His love forever. Ladies and Gents, we have another adult in the family. Sarah Lim Shu Yi has just turned 21! My God, that is freaking old. now all she needs is a man. ahahahahaha.